If you were in showbiz and also a parent, how can you manage to take care of your kids? How can you still manage that your son/daughter can still enjoy their childhood life with you? Let us see how this Alcasid couple shows how their son enjoys his childhood life. Ogie was recording his son and daughter moment and got a nosebleed while his daughter Leila was having her nails done. On their next scene sibling’s scene, when his sister was putting something on his face, he was playing with his sister’s stuffs, Ogie can't even say a word to his daughter and son, it seems that they do have a good bonding and they are raised well by their parents. 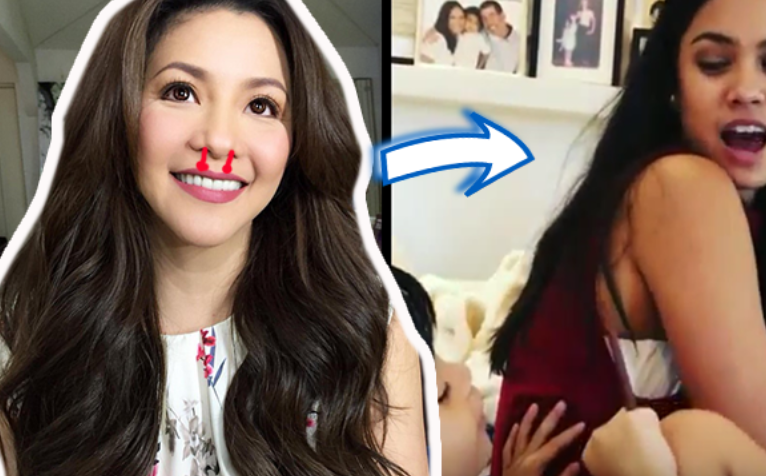 We can say that Regine and Ogie are really a good parent, Nathan can still enjoy his childhood life. While Regine was recording a video, Nathan plays with his pie face toy while he was seated on their dining table when the pie hits his face, he actually enjoy the pie and thought that it was a bath soap, he enjoys scattering the pie all over his body and head, think Regine got angry? She even laughs what her son was doing with the pie. When it comes to motherhood, Regine has still part of being funny.” Ano mainit ba yung ice cream?” Regine Asked. ” Yeah” Answered Nathan Let us congratulate them for being a good parent and still they can manage their showbiz. Also salute to all great parents!